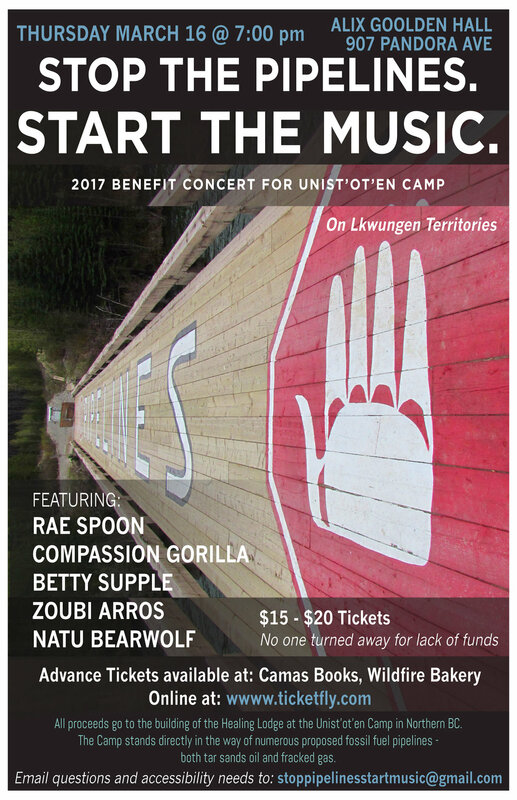 On Thursday, March 16th, please join us at Alix Goolden Hall (907 Pandora) for an Unist'ot'en Camp benefit concert. Doors open at 7PM, event begins at 7:30, and runs until 10PM. Tickets are by donation, from $15-$20 (No one turned away for lack of funds), and can be purchased at the door or in advance - online at http://www.ticketfly.com or in person at Wildfire Bakery or Camas Books. The event will begin with a welcoming from Esquimalt and Songhees First Nation representatives, and a presentation from the Unist'ot'en hereditary chiefs, including the Camp spokesperson, Freda Huson. We will then start the music and enjoy performances by Natu Bearwolf, Betty Supple, Zoubi Arros, Rae Spoon and Compassion Gorilla. We would like to acknowledge the time that many people in our community are donating to put on this event - from postering and hosting to playing music and raising funds - and would humbly request your help in spreading the word about this benefit concert. It would be thrilling to us to pack Alix Goolden Hall and show the Unist'ot'en that people here support their courageous and important resistance to pipelines crossing their territories. Thank you! BACKGROUND: The Unist'ot'en have sustained an unbroken relationship with their territory for thousands of years and have continued to practice their traditions in spite of intense and ongoing colonial encroachment. Today those practices include harvesting food and medicine from their territory, building a Healing Centre to address impacts of colonialism, and running many camps and workshops to share skills and knowledge. They are also currently resisting, among others, the Pacific Trails Pipelines and Coastal GasLink project, which are intended to transport fracked gas from Treaty 8 territory to LNG plants on the west coast. Learn more about Unist'ot’en Camp at http://unistoten.camp/ or on Facebook at https://www.facebook.com/unistoten/. You can also watch this short documentary: https://www.youtube.com/watch?v=ynR7MlcVCeI. 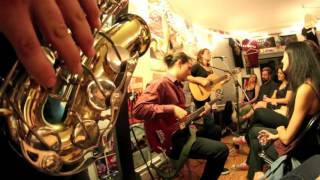 Natu Bearwolf plays acoustic guitar and sings in English and Wet’suwet’en. Betty is a songwriter and performer who plays half-time, hip hop inspired mandolin, rich, raw keys and some folk, jazz guitar with beat box vocalizations, as a solo musician or inside one of her collaborative projects. 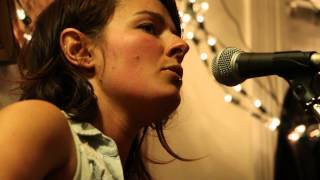 She has been making heart invoking, fancy tickling, sultry and dance around music across Canada for the last decade, delivering her version of cheeky, soulful folk, remixing beats inside her body and boxing them out with melodic poetry. She’s toured venues and festivals from west to east coast and back on her own and with bands, including Victoria Jazz Fest, ArtsWells, The Field, Surrey Fusion Fest, Surge Fest, Campbell Bay Music Fest, Kispiox Valley, Bella Coola, Jasper Folk Fest, Arts on the Fly, Music on the Mountain, Winterfolk, The Woodstove Festival, Open Streets Festival, Penny Brook Farm Festival, Om Reunion Festival, Folly Fest and Quadrapalooza. Compassion Gorilla has a relentless drive to translate earthy and folkloric sounds into an explosive performance fit for the demands of the modern dancefloor. Their unique brew has been the life of wild dance parties for almost a decade, and while its music defies categorization the band keeps audiences feeling comfortably at home. What is a Zoubi? She is a quirky, quiet thing raised in the woods on Hornby Island, BC. She was once given a guitar and soon found peace in spilling her guts over tranquil melodies. 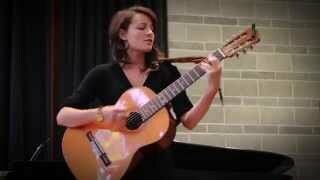 Now, Zoubi's folk sounds weave a cloth that Hannah Georgas may have crafted in the 1950's. Her authenticity enchants and leads listeners through a whirlwind of emotional connection seated in folk-pop tunes. She seeks to share stories that are difficult to discuss and with grit and some giggles, does just that. August 12, 2015, Zoubi released her debut EP, Tumble. Together with musician, Devarrow, she embarked on an EP release tour to Saskatchewan and back. 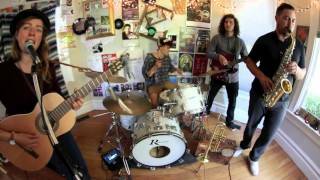 Returning to her home in Victoria, BC, Zoubi dove into the music scene with her new band, Zoubi and the Sea. In 2016 they performed Song and Surf, Rock of the Woods, Tall Tree, Fernfest and Rifflandia Festival. 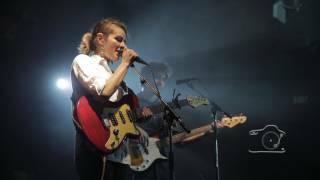 On stage, the ensemble is cohesive and playful, melding a Tegan and Sara folk-pop sound with jazz saxophone and funk rhythm. If you have any questions or concerns about this event, please send an e-mail to [email protected] In the interests of accountability and transparency, this event is being coordinated by volunteers Anna Gerrard, Seb Bonet, Colton Hash, Chris Fretwell, and Joshua Goldberg, with support towards the event from OUST, Social Coast, UVic Social Justice Studies, the UVic Sustainability Project, private donors, and many community volunteers helping make the event possible. We want you to be able to attend; let us know if we can help! Information below gives some details about accessibility. If you have any questions, please let us know. We are still learning about accessibility and would love to hear feedback about how to create events that are maximally accessible. * The closest bus stop is the #6 stop at Quadra just south of Pandora, or the #2, 27, and 28 stop ½ block away on Pandora Avenue west of Quadra. There are wide curb cuts on all four corners of Pandora and Quadra (route to the venue from these bus stops). There are also bus stops 1½ blocks away along Johnson Street (#2, 24, 25, 27, 28). * Bike lockup: There is 1 space in the front left side of the venue with another 2 lockup spaces one building to the left of the front entrance, and a street sign that could also be used for bike lockup. There are 23 bike lockup spaces at the back of the building (off Johnson Street). a) The front door will be open at 7 PM. There are 5 stairs leading to the front door, with a metal handrail (on both sides but handrails are not both graspable at the same time given 6' width between handrails). The stairs are pebbled concrete, 17" depth, and ranging from 5-7" height (not uniform). Note that the handrails do not extend past the top riser and bottom tread so there is no assistance past the first/last step. It is 13’ from the front door to the closest seats. b) There is a back entrance that can be accessed either from the parking lot off Johnson Street (no public parking spaces, but a loading zone for drop-off/pick up of people and mobility devices), or from a gated ramp off Pandora to the left of the building. Both the back door and the ramp are locked at night but you can let us know in advance if you want to make specific arrangements for arrival time, and we will also have volunteers at both entrances to get staff to unlock doors/gates if needed. For the back parking lot, it is 37' from the loading zone to the back door and there is a short shallow paved decline from the drop-off zone to the paved path to the back door. For the ramp off Pandora Avenue, there is a ramp up to a level concrete surface and then another ramp down to enter into the back door. The ramp has metal handrails on both sides (37" width between bars); there is an interruption in the handrails at the gate, with handrails continuing after the gate. * Seating: Most of the seating is wooden pews (bench with back) with no armrests except on the ends of each pew. On the main floor there are at the front left side of the stage 5 narrow chairs with armrests (for people who need arms to get in/out of the seat). There are also some empty spaces at the back of the main floor, on left and right sides, where seats have been removed to make space for 6 wheelchairs/scooters (3 on each side), and portable chairs for an attendant to sit beside; or there are spaces in the front row for a wheelchair < 33" deep (including footrests and handles). There is additional seating on the 2nd floor mezzanine which venue staff has advised is not accessible to people with mobility devices. The floor surface is wood or tightly woven carpet with a small metal lip differentiating specific areas that need to be kept free for egress. The venue is open seating but if you need to reserve a specific seat, you can let us know via [email protected] or _____________________. There are two multi-user bathrooms with stalls, located at the back of the building (behind the stage/seating area, accessible via sloping pathways from the main seating area). Signage is gendered. and we are not sure whether venue staff will let us use temporary signage to create gender-neutral bathrooms for this event. If we are not able to de-gender the signage, we will be making announcements at the start of the event and at intermission that people can use whichever bathroom they want to regardless of signage, and we will be offering bathroom accompaniment for anyone who does not feel safe in gendered spaces. Venue staff have advised that both both bathrooms were renovated to meet code for wheelchair accessibility. In the bathroom marked “men” we were able to confirm that the door is 47" wide and has no push-button, so some people may need help opening the door and holding it open while wheeling through. There are two stalls, with one with a 30” stall door and a grab bar to the left of the 19” high toilet. The other toilet is 16” high. The sink counter is 28” high and one of the three sinks has a soap dispenser near the middle left edge of the sink (13" from front of counter). Sink handles are 17" from edge of counter and are wing handles. The paper towel dispenser is 52" from floor. We were not permitted access to the bathroom marked “women” to confirm what facilities are available in that bathroom. * Scent: As fragrances can be harmful for individuals with respiratory disabilities and people with multiple chemical sensitivities, we request that people not wear scented products, including essential oils or other “natural” scents (please read http://www.peggymunson.com/mcs/fragrancefree.html). In our walkthrough of the venue we noticed that they use scented soaps in bathrooms and that there may also be scented cleaning products. If you have scent sensitivities we would like to hear ideas on ways we can try to make the venue safer for you to access, or potentially to livestream and/or record the event if there are not ways to make the venue safe enough..
* ASL or other interpretation, live-captioning, or other audio accessibility: Please get in touch with us in advance via [email protected] if you have accessibility needs regarding the spoken word segments of the benefit, and we will do our best to arrange assistance. Note that we need as much notice as possible to book interpreters, live captioners, or other assistance. * Children: This is an all-ages event. No alcohol will be served at the event, and we will not be providing childcare, although we would love for young people to come and enjoy the music and presentation. If you have any questions about accessibility or needs to access the space that we can help with, please let us know.